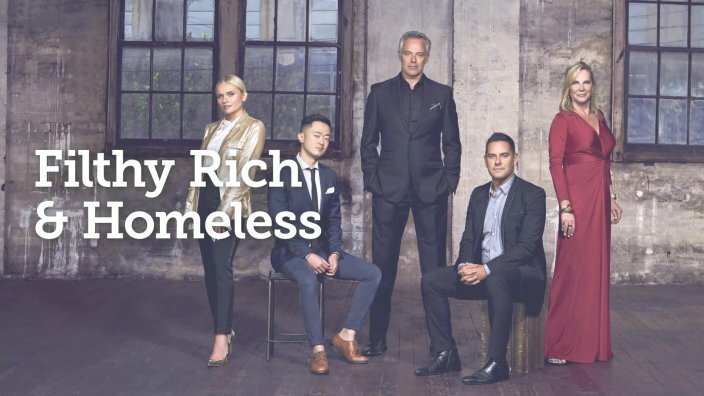 Filthy Rich & Homeless airs on SBS over three nights at 8.30pm on Tuesday 14, Wednesday 15 and Thursday 16 August, followed by a live special at 9.30pm on Thursday 16 August. Actor and broadcaster Cameron Daddo is one of the most recognisable faces in Australian show business. After 25 years in Hollywood, Cameron is now back in Australia, treading the boards in theatre productions, presenting for Smooth FM and developing new film and TV projects. Having enjoyed a secure middle class upbringing in Victoria and now living on Sydney’s Northern Beaches, Cameron’s no stranger to privilege. The former presenter of TV hit show ‘Perfect Match’, can be found surfing, working in TV, radio and theatre and enjoying life with his wife (former model Alison Brahe) and their three children. But life hasn’t always been this good. Back in 2008 in Los Angeles, Cameron’s family lost their home during the GFC and faced the uncertainty of financial meltdown. Honest about his feelings towards some homeless people who beg for money, Cameron is very open to this new experience and keen to learn about what life is like for the thousands of Australians with no place to call home. When Skye Leckie was asked to take part in the series, she admitted to feeling ‘very, very scared.’ But it was a challenge she felt she had to say yes to. Crowned Sydney’s ‘Charity Queen’, Skye has worked tirelessly raising millions of dollars for good causes, receiving an OAM for her efforts. The 59-year-old wife of the former Channel Seven CEO, is also a prominent and glamorous figure on Sydney’s social scene. And once a publicist at David Jones, Skye believes that anyone can achieve success if they work hard enough. Skye’s not dedicated a lot of time to working with or for the homeless. But given this opportunity, she wanted to immerse herself to gain a greater understanding of homelessness and to shine a light on an issue she thinks we should all know more about. Author and journalist Benjamin Law is an inner city intellectual and opinion former. The son of Chinese immigrants, 35-year-old Ben knows he has built a privileged life for himself. A typical week could be writing his column for a national newspaper, working on a screenplay, hosting a literary event, swimming and squeezing in a bit of time to make some homemade Kimchi. Compassionate with a strong concern for those who are less fortunate than himself, Ben rails against those who argue homeless people should drag themselves out of their situation rather than ask for a handout. Independent member of the NSW Parliament for the inner-city seat of Sydney since 2012, Alex is passionate about tackling social inequality when and where he sees it. He made his name leading the marriage equality campaign for more than ten years including being a leader of the successful ‘YES’ campaign. But at 37, Alex admits that he hasn’t done enough yet to tackle the issue of homelessness. The MP wants a first-hand experience to try and better understand what is one of Australia’s greatest social challenges. Unsure of how he’ll cope without the loving support of his husband Victor and away from the daily cut and thrust of political life, Alex believes he’s jumping in at the deep end of a pool and has no idea how cold it might be. Actress, singer, model, and Instagram phenomenon, 19-year-old Alli (at the time of filming) is popular, privileged and beautiful. Based in L.A, the Aussie born teenager boasts 1.4 million Instagram and Twitter followers and sees her social media platforms as a way of being a role for the young. Alli admits to knowing little about homelessness but is keen to explore the issue and in particular start to understand the hardships many young Australians face every day. Very close to her family, Alli’s biggest concern is safety on the street and how she’ll cope without her mum for ten days. Stay on top of every minute of the live SBS coverage of the 2018 Tour de France streamed at SBS On Demand and broadcast on SBS Television. It's time to discuss episode 12 of The Handmaid's Tale, 'Postpartum'. The astonishing life and brutal death of gorilla conservationist and researcher Dian Fossey is explored. Exploring the human struggles that fuel True Crime stories.